A colorful, striped crochet baby blanket perfect for your little ones or a crochet blanket to use as a lap blanket. A modern baby blanket that would look perfect in any nursery, with a touch of vintage style. This striped blanket is perfect for use with car seats, strollers or just cuddling up for a nap. It would even be fantastic for a one of a kind photo shoot for a sweet little one. A generous size of approx. 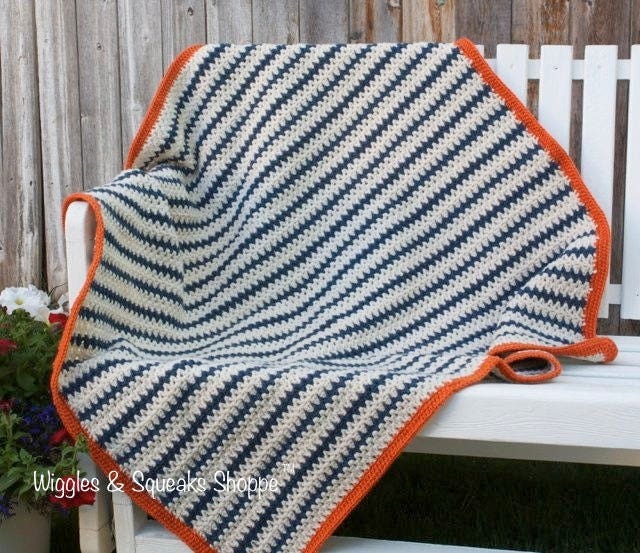 40" x 40", this blanket can be used for years to come and loved forever. It is a perfect baby blanket gift for new additions to the family, a toddler blanket to be loved on or as a cozy throw blanket for yourself while enjoying a good book. Crocheted with acrylic yarns for ease of care and use. This crochet blanket should be washed with a gentle cycle alone (no bleach) in warm water and then tumbled dried with low heat. Quality acrylic yarns were used because of their durability, longevity and easy care so you will be able to use this crochet blanket over and over again for continuous warm snuggles. I am so impressed with the quality of these dishcloths. Kar's work is impeccable and these dishcloths have already been put to use. I'm in love with the color selection, the speed of the custom order, and delivery schedule. Love, love! This was my first blanket I received from Kar and it is PERFECT! The colors are vibrant and the perfect girl blanket to last for years!! I liked it so much when it arrived- I already had her make me a custom granny square blanket as well to use for my daughter when she is in the car seat or stroller! Kar is extremely friendly and easy to work with. She was enthusiastic and really cared if I was pleased with my purchase! I will definitely order from her in the future!